Home Diet & Weight Loss Exercises & Workouts Health & Fitness 4 Different Types Of Belly Fat: Find Yours And Learn How To Get Rid Of It! 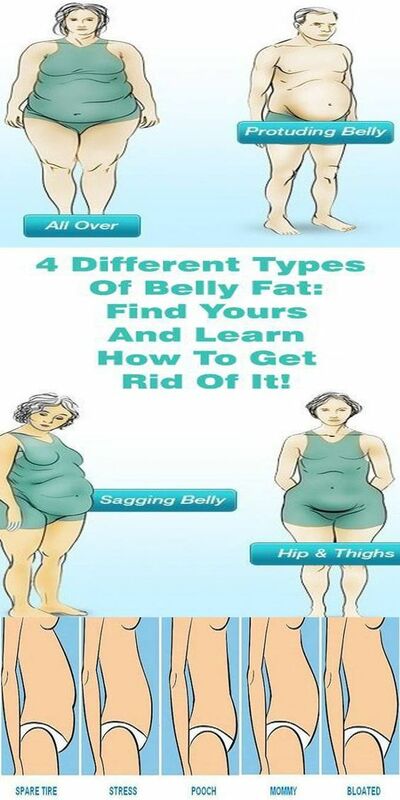 There are various types of belly fat. If you want to find the right exercises for your body and to lose the excess weight, the first thing that you need to do is identifying the type of your belly. Otherwise, you will have difficulties in losing all those unwanted excess pounds. Sagging belly is characterized with excess pounds in the lower part of your abdomen. The name itself describes it completely- it’s sagging! The accumulation of the fat in this body part is caused by insufficient physical activity and always consuming the same caloric and fatty foods. Supposing that you want to lower your stomach size and to reduce the fat, you should start moving and incorporate some healthy diet, comprised of smoothies and freshly squeezed juices. The fitness experts say that those people who tend to accumulate the excess pounds in the lower part of the stomach, thighs and hips, are under an enormous stress. Because of the stress, very often they feel bloated and they have digestion problems. If you want to lose weight, you need to stop eating junk food, reduce the caffeine intake and stop skipping the meals. Skipping the meals is so not good for you, because the moment you sit on the table it only makes you eat more. Or even worse, it could lead to the development of various diseases, among which is diabetes. If you are among those who have this type of stomach, then you spend the majority of your time sitting, and you are not moving enough. Also, the sweets are your favorite treat! If you want to lose weight, you need to reduce the sugar intake, be physically more active, and also stop consuming junk food, alcohol and carbonated drinks. This type of belly is a result of excessive consumption of carbonated drinks and junk food. Every organism has many difficulties in processing these. In addition, the reduced minerals and vitamins intake just contributes to the formation of this belly type. Therefore, if you want to lose some weight and also to reduce your protruding belly, you need to increase your consumption of healthy drinks and food. The healthy diet is going to meet the needs of your gastrointestinal tract and it will help you reduce the bloating. In order to achieve your goal, implement a moderate physical activity and eat healthy.